Paul Flaherty and Chris Corsano's Low Cost Space Flights is a tough recording that has no fear of a high pitched squawk or a tumble of the drums. I wonder, as I sit here enrapt with the music pouring out of the speakers, what drives discerning listeners to seek out such difficult music? Maybe one reason is that the music is from such an honest and pure place that the vitality of it makes such an uncompromising blast of energy so fascinating. From the primal to the sublime, there is so much that reflects the hard to articulate feelings of our everyday existence that it takes music like this to help us say it. 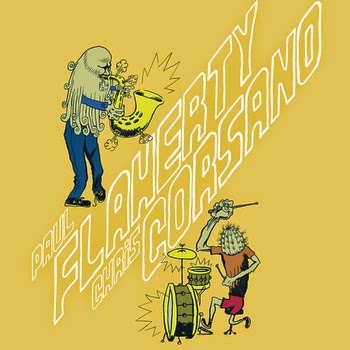 Perhaps too it's that the New England based duo of saxophonist Flaherty and drummer Corsano have a long creative history and their ease and effortless rapport is evident. Plus, Corsano is a master of creating a pulse that is both dense and supportive and light and responsive. It's a pleasure to hear him create such a big sound with Flaherty. And there is also the sound. Flaherty seamlessly vacillates between high pitched overtones, gutsy squalls and rich melodic lines. The 17 minutes of 'The Dog Paintings of George W. Bush' - from the title to the tone - captures anguish, terror, defeat as well as beauty and perseverance. The next track, 'Oranga Tang', is probably just a splice of the session that produced the first piece. Beginning as a solo run for Flaherty, by the end the sax has become a firehose drenching the listener with music. Each track that follows is a series of juxtapositions of tone, tempo and turn taking. The album closes on a high note - literally. The squeak that 'Drunk-Faced Sun' begins with ends up a melee with the drums by the end. While I thoroughly enjoyed this low cost space flight and being flung through that often vast empty space of my head, I acknowledge that I have not really answered my original question. However, here is one I can: "Is this music everyone would enjoy?" Nope. But chances are if you're reading this blog, it just may be for you. Limited edition LP and digital download. You're right Paul - I've downloaded the album and it's marvelous stuff. Corsano is such a wonderfully fluid drummer. Great! If you have a chance, check out the LP version. The cover is great. 1. I have little room left for additional LPs and a digital download takes up no space. 2. I have so much music that it really has got to the stage where the only easy way to find something is through searching a digital collection. Once you've done that for a while, there's no going back. 3. LPs can be expensive and postage costs prohibitive, particularly from the U.S., as in this case. The download from Bandcamp cost me £4.50. I've not checked, but the LP plus postage would probably be closer to four times that. I'm not sure it's a cost I can justify. 4. Although I've tended to side with vinyl in the analogue v. digital debate, it's now got to the stage where they're about even. I still buy LPs when there's no alternative, but I find it increasingly hard to justify. I wonder if anyone else feels the same about any of the above? A great duo. Saw them open for Joe McPhee and Peter Brotzmann last year. By now, they even hold their own against a top billing with names like those! Colin - totally understand. I love LPs and tend to reserve their purchase for older out of print items (usually). Funny thing, I'm running out of space on my hard drive but still have some space on in my record cabinet! Mark said....Colin, I recognise each of your points. I've not made the jump to digital yet as I've not found a satisfactory playback system to connect with my 'vintage' amp. More research in the New Year and I'll be following you down the same path regretfully but needs must and I can't sit on or eat off piles of LPs and CDs! Hi Colin, I have digitalised all my music, and it's so much easier. Yet on the other hand, I cherish some of the vinyl LPs. Call it nostalgia, but I love the physical aspect of it, limiting the number to the ones I really like (the 5 star albums.